In order to non-destructively inspect bond quality of composites of aircraft radome and empennage, the conventional solution is to use high frequency ultrasonic pulse-echo flaw detector and/or ultrasonic C-scan. A new instrument, based on the lowest order asymmetric plate wave excitation and swept frequency amplitude-phase display, was developed in the author's laboratory. One of the main advantages of the instrument lies in that the planar amplitude-phase diagram can give a very intuitive view of the composite fault, such as disbond, unbond, crushed core and delamination. Due to its capability of detecting above-mentioned faults without using couplant between probe and surface of the material under test, the instrument is consequently suitable for field applications, and especially for inspection of large area. This paper aims to present our results both in theory and in experimental work. Composites, such as GFRP,CFRP and Kevlar are widely employed in aeronautical and aerospace structures due to their highly desirable properties of relatively low weight, high stiffness and damage tolerance, and especially very high specific strength. For example, in modern aircraft, radome, fin, rudder and empennage are mainly made of composites. Unlike metallic material, composite shows little sign before failure in the course of usage. The inspection of internal hidden faults of composites, such as disbond, unbond, delamination etc, are therefore of our major concern. Composite is characteristic of anisotropic, heterogeneous and dissipative properties, because of which it is difficult to find effective inspection means for those faults. The conventional solution is to use high frequency ultrasonic pulse-echo flaw detector and/or ultrasonic C-scan. The method is however not very suitable for field applications due to its requirement for couplant. Lack of effective field inspection means is a potential source of accident. For example, in the summer of 1996, due to delaminations of radome composites , when an aircraft was to take off , some part of skin composites were peeled off by air flow and went into the air inlet of engine, which was almost leading to a serious accident. Present author was then asked to inspect radome composites for the same type of aircraft and to classify bonding conditions. One recent accident occurred on the aluminum skin- (nonperforated) aluminum honeycomb composite of perpendicular empennage rudder of an aircraft. A section of area 1330´ 410mm was peeled off during flight. The breackage of the rudder was due to disbond and honeycomb core corrosion. Low-kilovoltage x-radiography is major NDT method to detect internal corrosion, but the method is not effective in finding unbond or disbond faults. Also, using x-radiography is always inconvenient for field applications. At present, the effective in-situ means in finding internal faults of composite is based on visual inspection and tapping. These methods are dependant on experience and are hardly effective in finding internal faults of composites even when practiced by experienced persons. 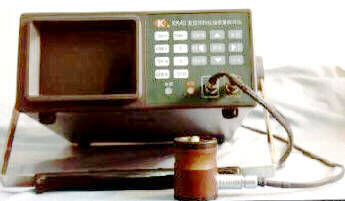 Apparatus based on sound impedance change was used to test bonding quality. It is noted that although the apparatus was effective in finding unbond or disbond for aluminum skin composite, it was not effective for composites with skins of glass fibre and/or carbon fibre reinforced plastics. Also, the instrument is viable to external circumstance change because it uses a single parameter of amplitude to diagnose the bond quality, and it hence has very low diagnostic reliability. In order to solve the problem, new approach using multiple parameters to inspect composite fault is needed. From the point of view of sound wave propagation, the radome (or empennage) can be viewed as a thin plate because its thickness is much smaller than the wavelength of sound wave. When in good bonding condition, the thickness of the radome is larger than that when in unbonding or poor bonding condition. In the later cases, sound energy shall be concentrated in less volumetric space and hence the received sound wave by a surface probe will have higher amplitude and different phase. Therefore, the bonding conditions can be evaluated by analyzing the amplitude and phase of the received signal. A phase-amplitude diagram of the signal might be the best way to show plate thickness changes which are closely related with bonding conditions. Where, m is the shear modules, cl and ct are longitudinal and shear wave velocities of the solid plate material, respectively. For particle velocity at surface, z in equation (1) can be replaced by 2d or by a parameter closely related with 2d, the thickness of the plate. It can be assumed that response at surface is dependent on plate thickness 2d, the amplitude of applied force and shear module of the plate. The effect of thickness on signal amplitude and phase for longitudinal wave is different from that for shear wave. It can be seen from (1) that thickness d has a much larger effect on shear wave than on longitudinal one. The flexual wave (mainly shear wave) is, therefore, always preferable in using phase-amplitude diagram approach. In general however, large plate thickness will lead to weak response for both waves, and vise verse. respectively, where E is Young's module, n Poisson ratio, v angular frequency, r density and d half plate thickness. For the purpose of practice, perpendicular excitation is the most likely one to be employed, and hence the dominant mode of existing wave in the plate is the asymmetric one (the flexual wave), see fig.2. Possible modes which can exist in the plate are dependant on the multiply of plate thickness and frequency. For fixed frequency, when thickness is increased, possible modes are also increased, resulting in further decrement of the amplitude of the lowest asymmetric mode. Based on this, an instrument was designed to use planar phase-amplitude diagram of the received response signal to give an intuitive picture of the bonding conditions, details of which will be described later in this paper. A transmitting probe and a receiving probe were combined together to form an integrated probe set, as shown in fig.3. For certain plate material, plate wave velocity is a function of frequency and plate thickness. If the excitation amplitude is kept fixed and thickness is varied, it can be made that the lowest asymmetric mode is dominant through whole frequency range. In fact, due to different propagation velocities, the extension wave (symmetric mode) can be filtered out through adding a gate of delay trigger in the receiving circuit. In reality, T- and R- probes are enclosed in a rigid compartment and hence the distance between the two probes are fixed. Due to perpendicular excitation being applied to radome surface, flexual wave is always predominant inside the plate. Instead of pulse force excitation, a swept frequency burst of sinusoidal wave of 8-12 complete cycles was applied to T-probe, with its frequency being varied from fl to fh, say from 2kHz to 70 kHz. The change was made in 256 steps in a fixed time of less than 1 second. For each fixed frequency, a vector (x,y), where x stands for amplitude and y for phase, was obtained from the output signal of R-probe, which was displayed as a point on the phase-amplitude plane of the monitor screen. For swept frequency input, a phase-amplitude diagram can be obtained from the 256 sweeping points, which was closely related to bonding conditions. While disbond or unbond occurs, the "equivalent" plate becomes thinner and the energy of received signal becomes larger. Hence, a large phase-amplitude diagram will be displayed on the screen. The other way to achieve the same results is to use frequency-modulated sinusoidal burst signal to excite the T-probe instead of present swept frequency one. Comparisons of the two different approaches were omitted here. The schematic electronic diagram of the set-up was shown in fig.4, where the burst signal of sinusoidal wave applied to T-probe was supplied by frequency synthesizer, and the received signal, after being properly conditioned, was digitized by A/D converter and further processed by CPU. The entire system was controlled by the logic controller and the CPU. System software flow chart is shown in Fuig.5, and all menu is written in Chinese for the convenience of field application. Fig.6 is the photography of thus developed inspector. It is a fully menu driven and smart instrument. Most operation programs and procedures available for existing aircraft can be stored in it. Test was made on samples of 20×30cm aluminum skin- aluminum honeycomb core, carbon fibre skin-paper honeycomb, and glass fibre skin-paper honeycomb composites. Results for 20×30cm carbon fibre composite (paper honeycomb) are shown in Fig.6, where (a) is for normal area, (b) for unbonding area. In (a), all swept frequency points are concentrated inside a gate of 4 by 4 divisions, whereas in (b) swept frequency diagram spreads over a much larger area. Main parameters for the test are as follows: swept frequency range of 20kHz-40kHz, gain of 32, and a burst of 11 complete sinusoidal cycles with peak-to-peak amplitude of 30 volts. Test was also carried out for horizontal empennage of an airplane. Two separate disbonding areas were found. These faults are not fatal but much care is needed for the aircraft empennage to prevent any possible accident in the future. These tests show that so developed inspector is capable for field inspection of aircraft composite conditions. Present detector can be easily adapted to various circumstances and can hence offer a much wider application area. For instance, by using separate probes, the instrument can be easily used to evaluate bonding quality for other bonding structures employed in aircraft, as shown in Fig. 8. However, obtained swept frequency phase-amplitude diagram on the screen will have an opposite appearance, i.e. good bonding condition will give large diagram compared with the poor or even unbonding condition. In the later case, acoustic energy will subject to greater loss while transmitting from T-probe to R-probe and hence less acoustic signal will be received by R-probe. The instrument also can easily be modified to become an impedance measuring system which is useful in many cases for evaluating internal faults of composite, such as corrosion, crushed honeycomb core etc. For brevity, detailed descriptions on these will not be given here.